October 12, 1960 –The full length of the Congress Expressway is opened allowing Chicago drivers to travel on a high-speed highway from the Loop to the Du Page county line. It is projected that over 100,000 vehicles will use the new road each day. The Chicago Daily Tribune editorializes, “We hesitate to wave a wet blanket on such a glorious occasion, but motorists should be warned against expecting too much from this great improvement. It will be overcrowded in rush hours immediately and much congestion may be expected at the eastern end where the eight lane expressway becomes an ordinary city street …” [Chicago Daily Tribune, October 12, 1960]A unique aspect of the new road is the placement of rapid transit tracks in the median, a first in United States road building. Before the full road even opens, trains are carrying 76,000 passengers each day. The $183-million expressway is the first road to be completed in a comprehensive highway building plan expected to cost over $1.5 billion. 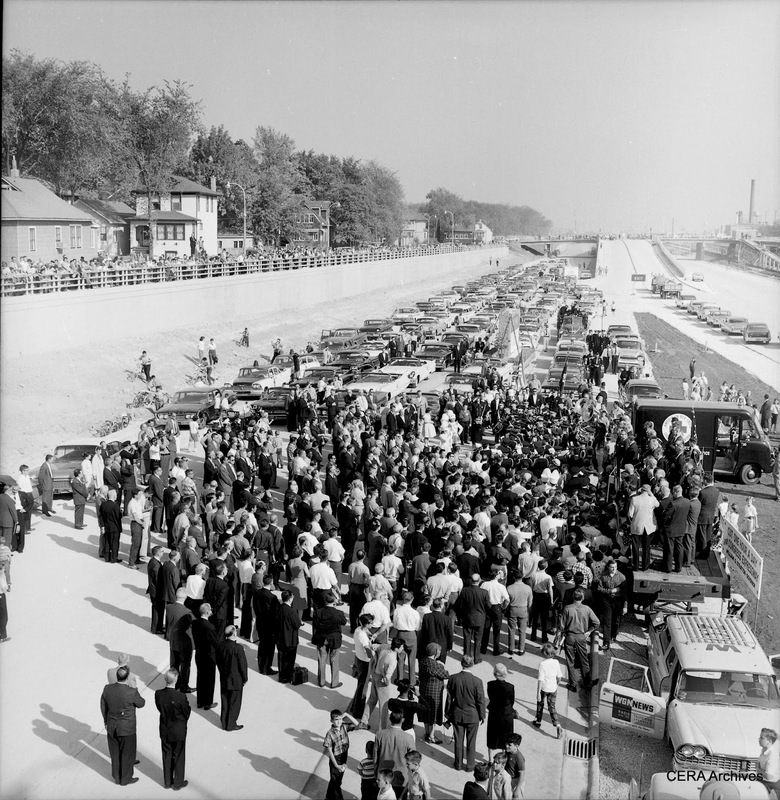 The above photo shows the official opening of the expressway on this date. 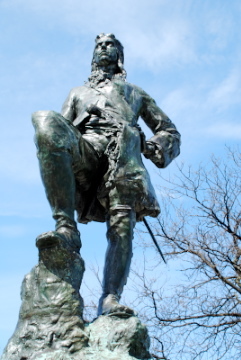 October 12, 1889 – On a cold and windy day 1,500 Chicagoans show up for the unveiling of the statue of Robert Davalier de la Salle in Lincoln Park. The ceremony begins with the reading of a letter from Judge Lambert Tree, the man who commissioned the statue. In the letter the Judge writes, “In studying the early history of the country, the services and character of La Salle have inspired me with the highest admiration, which I am sure is equally shared by all others who have read the story of his achievements. He unquestionably discovered the Ohio and Illinois rivers, and whatever may be the weight of evidence as to the real discoverer of the Mississippi I think it is beyond controversy that he was the first white man who ever descended the river to its mouth.” The Chicago Daily Tribune observes, “The statue is admirably located on high ground at the meeting of three roads . . . The memorial will always be highly valuable, an incentive to patriotism and a spur to grateful remembrance.” [Chicago Daily Tribune, October 13, 1889] The statue still stands at the junction of those three roads today, north of the Chicago History Museum at the junction of La Salle Street, Clark Street, and North Avenue. 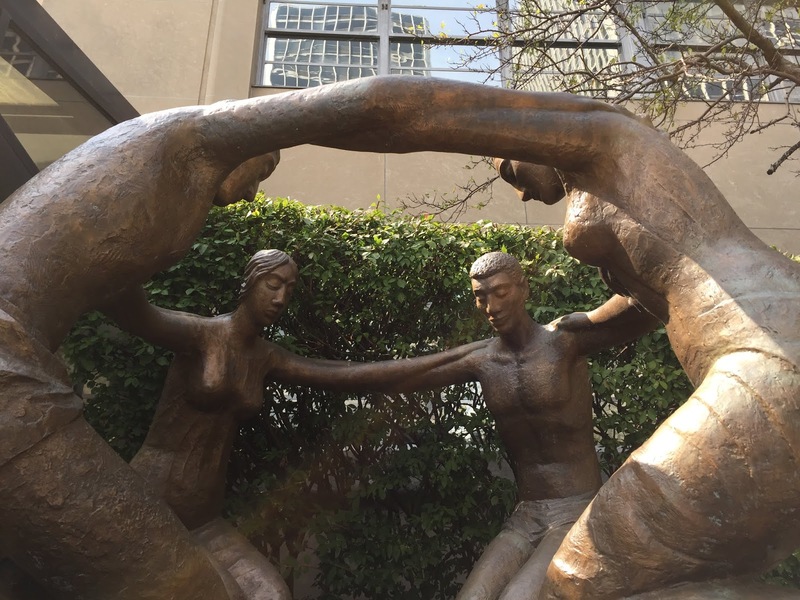 For additional information on the statue and on Judge Lambert Tree you can click here.